But won't I fall off when I get to where it's straight down? 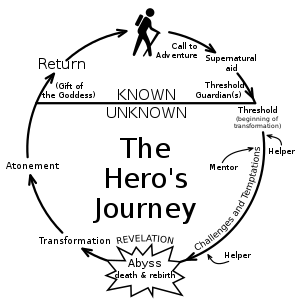 A lot of people – including many writers and game masters – take the idea of the “Monomyth” or “The Heroes Journey” fairly seriously. Fundamentally, the “Monomyth” is so generic that it can pretty well be applied to ANY human activity. That’s a large part of what makes the idea appealing – anyone can relate to it, and it lets anyone, deep down in the depths of their ego, consider themselves a hero. It also makes it fairly worthless as an insight, as a way of understanding mythology, or as a guide to writing good stories. There’s something you want or need – a goal to be accomplished. Achieving that goal will be a certain amount of trouble. For a time, inertia rules. But then you get up to go and do it. If you’re lucky, you get some help. You head out to deal with the obstacles. You start doing new things to deal with them. There’s a temptation to give up. Is the goal worth all this trouble? You make the decision – whether to continue or to drop the project. Armed with new determination, you continue! You achieve part of your goal! You are tempted to linger over that rosy sense of accomplishment instead of finishing up! You tear yourself away from that temptation, and continue towards the completion of your goal! You may need a little help with integrating your new accomplishment into daily life. You achieve balance, tying your new and old selves together! You are free to live your life with new confidence! OK there… Lets say you’re bored with the blank wall in your living room. You… want to hang up a poster. You face a problem: you need a hammer. You attempt to refuse the call; you glance around the living room looking for something else you can use without the bother of finding a hammer. You depart from your comfortable, everyday, life in your living room. You open the garage door and cross the threshold to venture into a strange and hazardous realm; the garage, where things have often fallen on your foot. You face exotic and frightening hazards; invisible spider webs, uncertain footing, and teetering piles of junk. Monstrous creatures oppose you, but can be bravely driven off or bypassed; after all, most spiders think you’re too big for them to deal with. You encounter the personification of your goal; the toolbox under the workbench. It offers many wonderful possibilities! You are tempted to linger in the exotic realm. Will you be needing any more tools? If you take along a screwdriver maybe you can fix that loose hinge on the front door! You center your resolve. You may not be as good with your hands as a home-repair specialist, but you can certainly do a few things around the house! You pick out the tools you will need to do a few things! Your quest has achieved it’s goal! Wait a moment! Do you actually have a nail inside? Perhaps you should look for a few of those while you’re at it! You resist the temptation to linger and head back towards your living room! The picture should have a picture-hanger with it! Abruptly you realize that, with your hands full, you cannot open the garage door to get back into the house! Fortunately, rescue is near at hand; even if you have nowhere to set things down, you can always ask your domestic partner to open the door for you! You re-enter the house, and set the tools down, so that you can clear the top of the buffet and prepare to work! You step up on a chair, achieve balance, and apply the tools you have quested for to achieve your goal – smoothly hammering in the picture-hanger! You test your new picture-hanger, step down, and hang your picture! Your life – or at least your living room – will be forever changed! But wait! Now you want to fix that loose board on the porch! Now that the power of the hammer is yours, a new quest awaits! Do I really need to go through how those same steps fit in with the need to lose twenty pounds? How a new diet plan may offer help and assistance? (Lose those unwanted pounds “like magic!”) How the terror of the Thanksgiving Turkey may imperil all your gains? The temptation to quit when progress seems slow? How – even if you achieve your goal – you will need to figure out how to fit the occasional dessert into your life while maintaining your new weight? The root of every epic heroes quest is no further away than your kitchen – or perhaps it’s stored in your garage. That’s why the “monomyth” seems so familiar, and thus seems like such a “powerful insight” – it’s because it describes your daily life and the daily lives of everyone you know. To produce anything worthwhile you need to go beyond the “monomyth”. It’s the unique touches, the unexpected twists – and yes, even the bad jokes – that keep people invested in your setting and make the trip through it interesting. I must have missed the part where I got supernatural aid, then died and was reborn last time I hung a poster in the living room. Seriously, all the banality occurs in the process by which you transform the story into routine tasks. If you stuck to the literal events of the monomyth, you would have an adventure story. Equally seriously, the Monomyth doesn’t involve any specific events; it’s supposed to be a framework into which all myths fit. The various stages have evocative names – but, as the various examples Campbell used show – they aren’t normally literal. As for banality… That is, of course, in the eyes of the beholder. If your hero happens to have a serious fear of spiders, then the quest for the hammer can be every bit as life-changing and – ultimately – as liberating as any classical myth. It’s also a lot more likely to happen in real life, which is something of a bonus. Anecdotes aren’t really evidence of anything – but I personally know a woman who has lived in four different houses over the past few years – and has never ventured into any of their attics or cellars for fear of spiders. For her, the quest for the hammer might be extremely meaningful and transforming. The trouble with the “Monomyth” is that – as it’s name indicates – it’s supposed to be a universal myth into which all tales fit. That’s pretty much true, as the epics of the hammer and the diet illustrate. Sadly, that also means that simply following the steps is no guarantee of coming up with anything really good. It offers no predictions, it doesn’t really explain why some tales become classics and others fail, and it doesn’t offer much of any guidance. Ultimately, the Monomyth has about the same explanatory power as “The faeries did it!”. It’s ornamental – but no more. Very true – but then those are more or less expected to be potboilers. I always saw the monomyth as an analysis tool. It is quite useful for establishing a common language to talk about stories and events. So, to me, it is more like a set of scales or thermometer. I don’t try to cook a meal with a thermometer, that is what the oven is for (writers imagination and style and effort, etc). But having a thermometer helps. Hmmm. I may have overstretched the metaphor. My point is that the monomyth is a useful tool, if you use it properly, but like all tools often misused. Don’t hate a wrench just because people try to use it to pound in screws. It’s not the tools fault. it is the (ab)users. Given that metaphors mean different things to different people, they often obscure communications rather than aiding them – while simultaneously providing a gratifying illusion of mutual comprehension. If the “monomyth” is an analytical tool… what does it measure? What are the units? Will two people applying it independently produce the same results? I suspect that you mean that it helps define the terms you use to discuss a story – most likely through allowing you to identify various events within it with elements of the monomyth so as to provide a common frame of reference. Of course, this implies that there was disagreement over the identification and interpretation of those events in the first place – and that that information is being discarded in order to fit those events into a generic pattern rather than being examined. The fact that the “monomyth” can be used that way supports the original article; it’s generic enough to be used to frame virtually any story – which makes it a poor tool for sorting them in any fashion. For a classic example of this sort of problem in action, consider Hemingway’s “Hills Like White Elephants”. The standard discussion on the story is pretty well established – but would your conclusions differ if you started off with the idea that “White Elephants are one of the most sacred, valuable, and wonderful creatures in existence” (true in some cultures) rather than the idea that “a white elephant is a useless but expensive thing that you probably don’t know what to do with”? The trouble with metaphors, symbolism, and any other form of fuzzily-defined terminology – such as the term “Hero” – is that their meaning relies on information supplied by the reader rather than by the work in question. Their use often makes a work seem deeply insightful and meaningful because they bring up deep associations in the reader’s mind that go far beyond the meaning of a more precise term – but those associations will differ from reader to reader and may not relate in any individual case to whatever it was that the author had in mind. The “deep meaning” is literally in your head – not in the work. That doesn’t mean that such a work may not be a critical and/or commercial success if it appeals to enough people over time – but it is not a clear form of communication. The stages of the monomyth are very vague. If two analysts find it necessary to resort to using them to talk to each other, then they almost certainly do not actually agree – and are covering up that fact by resorting to terminology that they each interpret differently. You can do that in literature. Try it in law, or engineering, or in most other fields… and you’re going to be in deep trouble.